"Why is it you wait for a bus for half an hour then three come along together". That's often said in jest, but it seems to really happen. The sad truth in Wiltshire is that the reason behind this stange (and un-useful) pattern in when services turn up is because that's how it's planned. 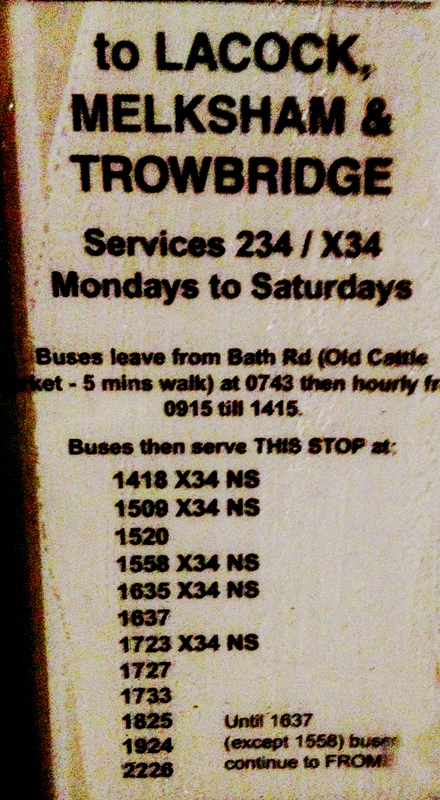 Look at this timetable of buses from Chippenham Station to Lacock and beyond 15:58 and a gap to [16:35 16:37] and a gap to [17:23 17:27 17:33] and a gap to 18:25. Whenever I've used those services, there hasn't been a need for multiple vehicles at the same time, so why is it like this? It's all to do with commercialism and the free market. Buses are run by several companies on these routes, and a bus that arrives at a bus stop a few minutes earlier that its competitor will pick up the passengers. "What about fares and tickets, though"? Well - the majority of users during the day of these "commercial" bus routes are travelling on concessionary passes - they don't pay to use the bus, nor buy a ticket. They are paid by the local council for the number of people they carry, at a percentage of [mostly] the regular adult single fare. Oh - yes - that's why adult single fares have got so high, since the bus companies want to maximise their total revenue and can afford to price individual paying customers out of the market. And that also explains why certain multijourney tickets have been "pulled" recently, as they used to be included in the calculation too. If there were true price competition, the free market might work. In the situation we have, it discourages fare paying custom, increases the gap between services much of the time, and reduces the overall income as two companies (such as Faresaver and First in our area) slug it out. It's rather like two fighters knocking the stuffing out of each other; they leave themseves both weakened. Does this matter? So - who are bus "customers". Not really the passengers - much more the local authorities. Who we need to take a firm grip and have everyone work together in quality bus partnerships. There are a number of very good - indeed excellent - officers at Wiltshire Council who look after buses and other public transport. The problem is, they're not allowed to take a firm grip on the situation because of the slippery layer of monopoly issues and legal frameworks that frustrate them at many turns. Q: why does the last (First) bus to Corsham leave Chippenham station a minute before the arrival of the train from Paddington? If you want to catch that bus, you need to leave Paddington 45 minutes earlier. A: could it be to ensure that the bus does not get delayed by train passengers in the event of the train being late, bearing in mind that a bus operator can be fined by the regulator for not running to time?